Nextgen Space MMO Game - Procedural Galaxy with Billions of Stars - Seamless Planet Landing - Twitch Based, Skill Centered Gameplay - Own Ships, Buildings, Cities, Space Stations, and Even Planets - Sandbox Style Gameplay. You Decide How You Play, Not a Class System. I dub this planet "Holymacaroni"
The sacred birthplace of the great Spaghetti Monster. I cant wait till this comes out, this game just keeps looking better and better. Keep up the good work you guys. I actually can't even remember what Infinity is about. The pics just are so amazing that you think of them instead of the game whenever you see the name. 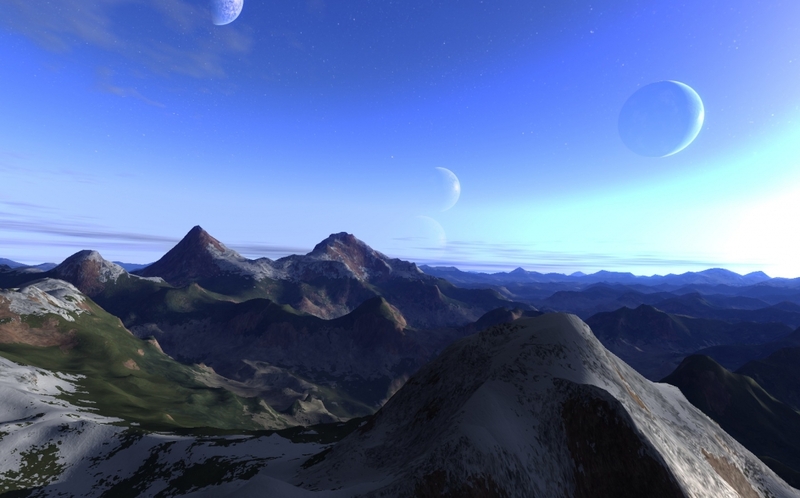 Holy crap, almost looks like Terragen. There are too much planets of the same size so close to each other, or not? Is that realistic and could look this way in the real galaxy? If it´s not realistic, will the planets in Infinity have normal distance between each other or not? Those are moons, at realistic distances and sizes. Multiple moons seen through the atmosphere of an Earth-like planet.